This hike begins off Forest Road #58. The trail head is well marked. The trail begins a moderate climb and it makes its way through fairly dense forest. There are only a couple of viewpoints along the way. At about a mile the trail summits out at a rocky area where you can get great views of Mt Adams to the east and Mt Rainier to the north. The trail then descends following a small stream part of the way. After a few switchbacks you will come to the junction of Trail #158. Keep on straight ahead. In only a few yards you will come to another junction with Trail #192. Again, keep on straight ahead. At about 2 miles you will come to yet another junction. 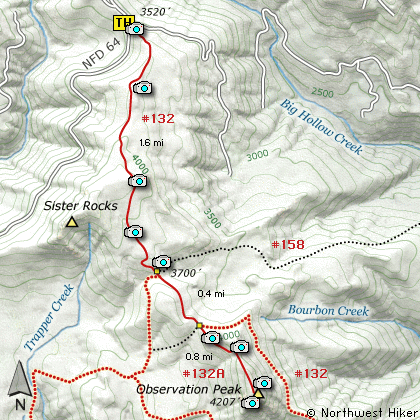 At this point, bear to the right, and follow Trail #132A. The trail gets a bit steep as you work your way up the side of Observation Peak. There is a fine viewpoint along the way, but the best views are waiting for you at the top. 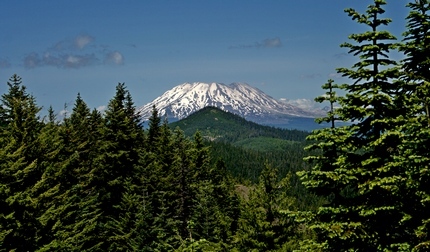 Upon reaching the summit of Observation Peak you are treated to wonderful views of all the surrounding terrain, including Mt St Helens, Mt Rainier, Mt Adams, and the Columbia River Gorge. Continue north on the Wind River Highway (FR30) for about 8.6 miles to the little community of Stabler and the junction with Forest Road 43, also called Hemlock Road. Continue northwest on FR30 for another 5.4 miles and you will pass a fish hatchery on the left. Continue on another half mile and turn right at the junction with Forest Road 3065, which continues straight ahead. After turning right at the junction with FR3065, continue another 2.1 miles to the junction with Forest Road 64. Bear left onto FR64 and climb steeply for another 6 miles to the junction with Forest Road 58. Bear left onto FR58 and follow this road for another 2 miles and you will come to the parking area and trailhead for this hike on your left.